It’s Christmas time and the kitchen is busy… there’s Christmas cake, Christmas pudding, gingerbread men and mince pies being made but this year I thought I would try something different. 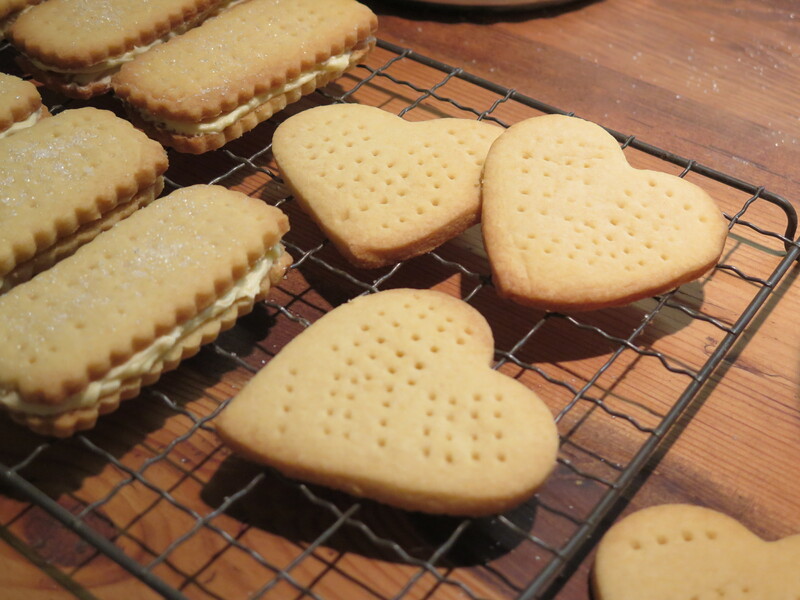 My favourite biscuit just so happens to be shortbread and when I came across this simple recipe I just had to make some, plus I got some new cutters from John Lewis and wanted to try them out! The ingredients in themselves are simple and the instructions are easy enough too, the process of chilling takes some time but I can assure you that it is worth the wait. Cream together the butter and sugar until light and fluffy. Mix in the flour to form a dough. Turn out onto a floured surface and knead gently until smooth. Roll the dough to roughly 5mm and cut out the desired shapes with a cutter. Grease some baking trays and place the shortbread onto them, prick with a fork and chill in the fridge for 40 minutes. Preheat the oven to 180C/350F/ Gas 4 and bake the shortbread for 15 minutes or until golden. Sprinkle with sugar and set aside to cool. Optional extra: I whipped up some buttercream using butter and icing sugar and spread some onto my shortbread to create custard cream style biscuits… they were very yummy! I will definitely try this shortbread recipe. Thank you for sharing Katie. Looks wonderful Katie. Thank you for sharing your holiday recipes. Merry Christmas and all of God’s blessings to you and your family.